When touring Rome, you should consider a day trip to Vatican City. It is the smallest country in the world, just over 100 acres, and is completed encircled by the Italian capital. While small, you will find enough things to do in Vatican City to keep you busy for an entire day. 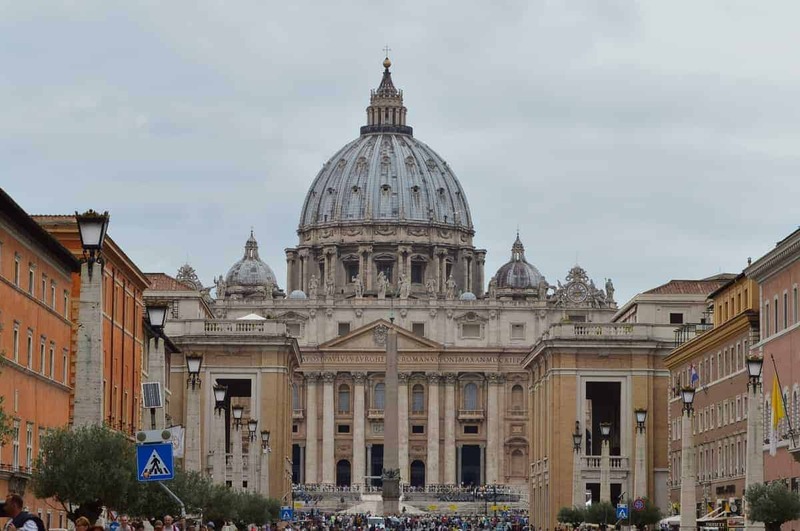 Taking the trip from Rome to Vatican City will allow you to see three main attractions: St. Peter’s Basilica, The Sistine Chapel and the Vatican Museum. In order to make the most of your time in Vatican City, you will need to plan your trip in advance. 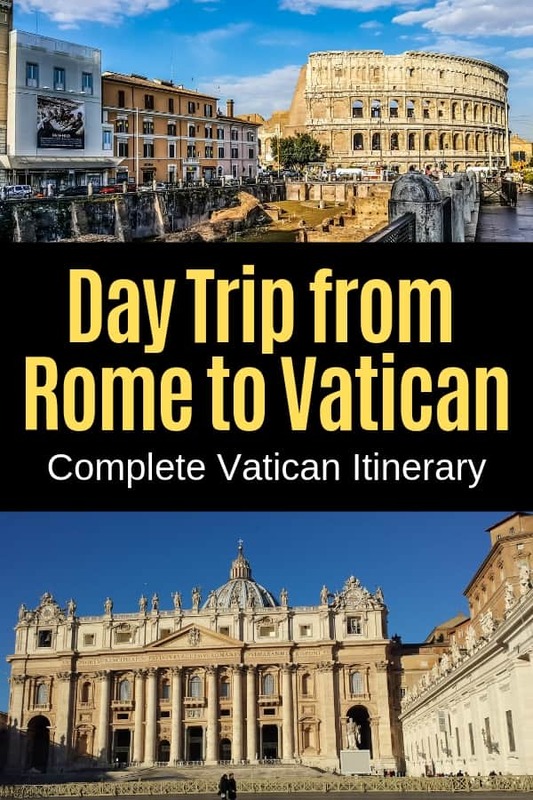 If you are visiting Rome and planning to try to do the Vatican City in a day, you have a few options. You can take a bus, the metro, a private car service or a taxi from Rome to the Vatican. You could also walk, but depending on where you are in Rome, that might not be the most feasible option, especially when time is of the essence. We recommend taking a taxi from Rome to the Vatican because it is affordable and takes you straight to where you want to be. Trust me, you’ll do enough walking in the museum. No sense having the extra walk from the metro station or bus stop. 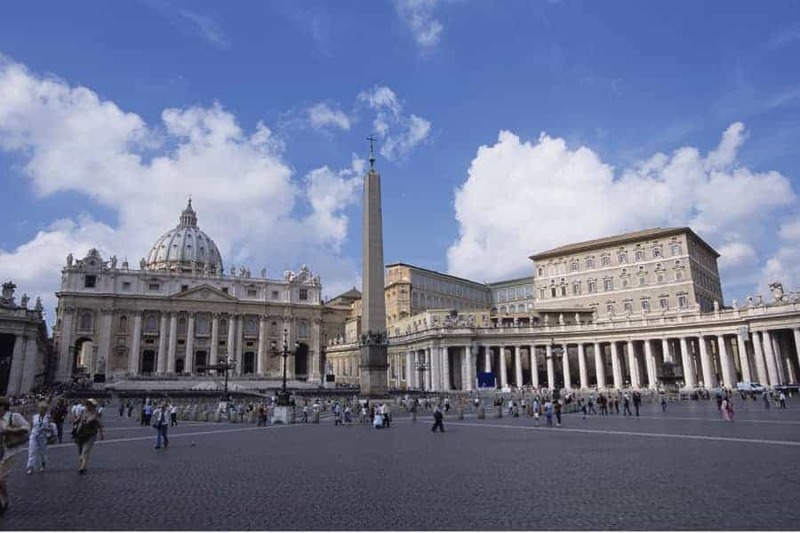 Touring the Vatican in a day is also a great choice for those taking a Mediterranean cruise and docking in nearby port town of Civitavecchia. You can take the train from Civitavecchia (about 1-2 hours depending on which train you chose) and see both Rome & the Vatican in a day. The trains are really nice and fairly inexpensive. Just be sure to check the train schedule and give yourself plenty of time to get back to port (in the event the train runs late or stops for no apparent reason). 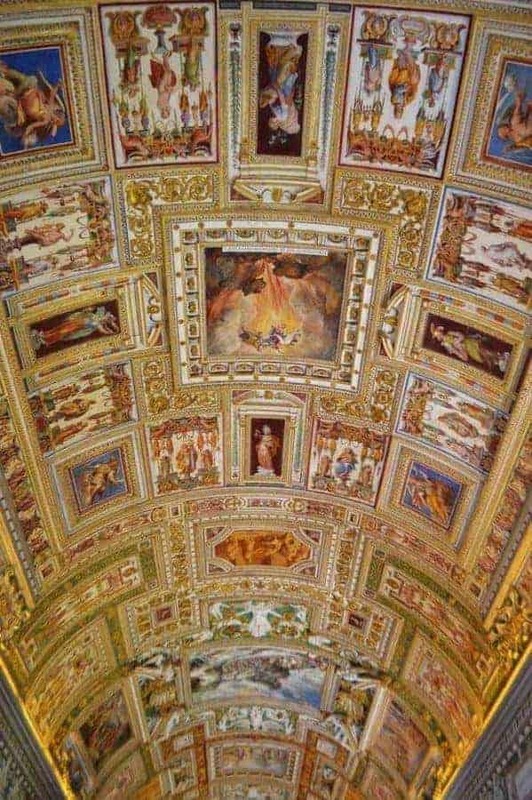 You will first want to understand a few things about Vatican City. It is NOT really a city or a town, but a city-state with nearly 600 citizens. These citizens are either part of the clergy, cardinals or the Swiss guard. Nearly half of the Vatican’s residents live abroad at diplomats in other parts of the world. You can drive or walk from Rome to Vatican City easily without having to show ID or Passport. While there is a train station, no one really uses it. The Vatican City is governed as an absolute monarchy with the pope at its head. Even though Vatican City is the headquarters of the Roman Catholic Church, you don’t have to be Catholic to appreciate this city-state has to offer. If you know in advance that you are going to travel to both Rome & Vatican City, you should consider getting the Omnia Rome & Vatican Card. It will pay for itself in no time! The Vatican Museum ends with the line going straight into the Sistine Chapel. After lunch head over to St. Peter’s Bascilica and climb the steps to the Dome. 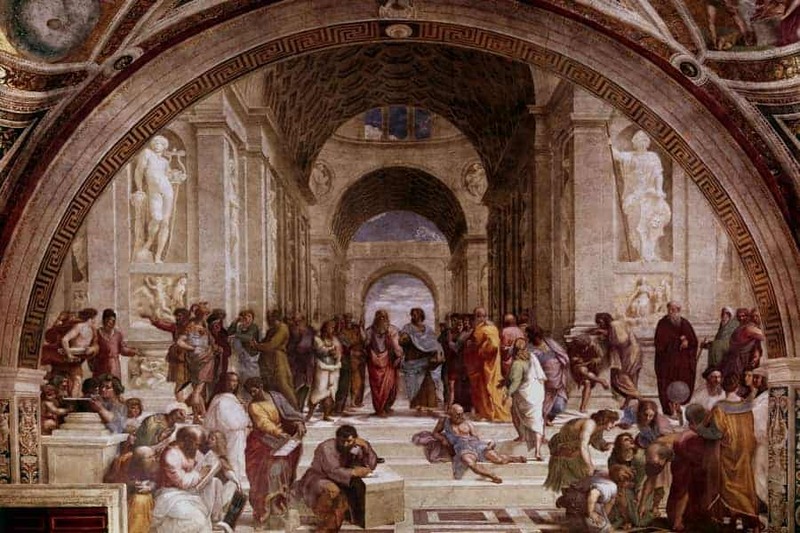 The Vatican Museum first opened to the public under Pope Clement XIV. He began the museum as a way to showcase his collections of sculptures of Julius II. 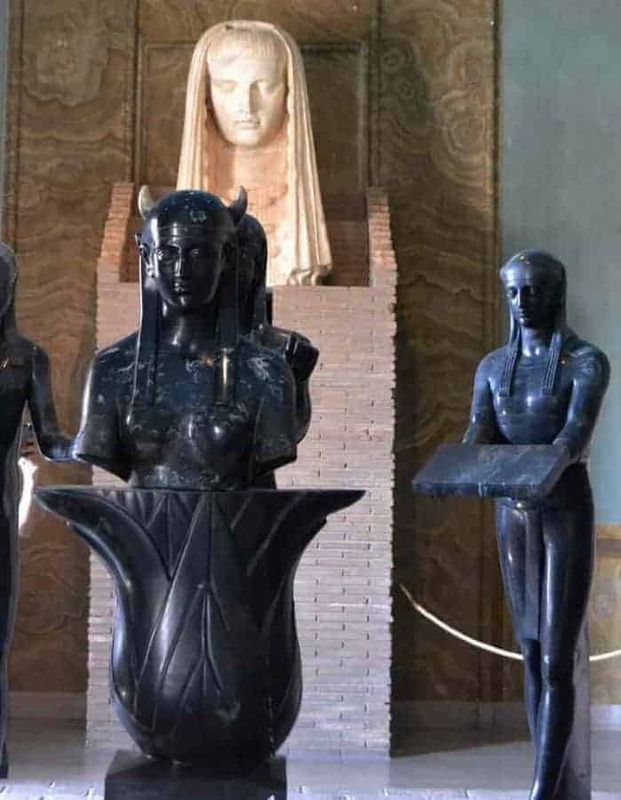 Over the years, other popes added to the collection and now you will find sculptures and art from Egypt to the 20th century (most notably are works from Michelangelo and Raphael). The Vatican museum is open from 10am-6pm (ticket office opens at 9am/ last entrance is 4pm). The full walking distance of seeing everything inside would be like walking 9 miles. You will not be able to see EVERYTHING in one day. Pace yourself. When you are on a limited time schedule, you may want to take a guided Vatican Museum Tour so that you see the highlights. 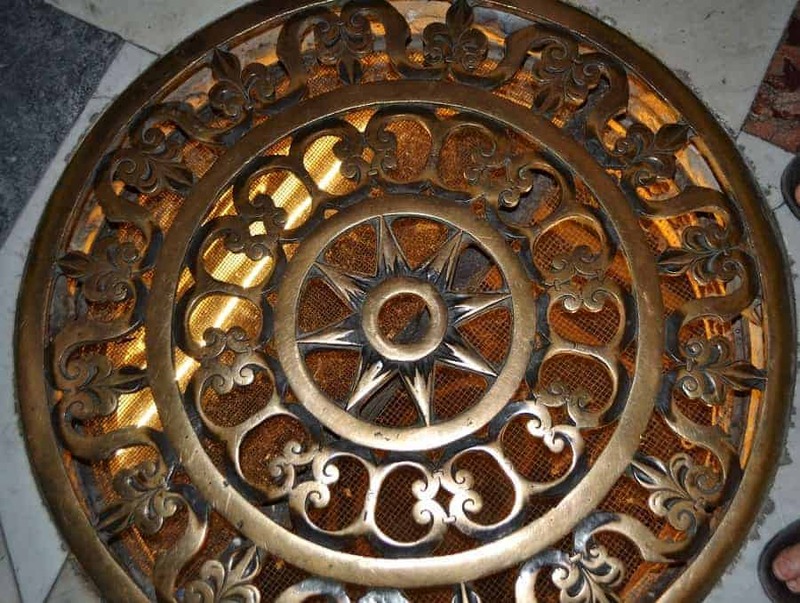 A tour guide can walk you through quickly so that you are able to see the main things most visitors want to see. The problem with this is that you might miss seeing things YOU really want to see. When you go to the Vatican without a tour guide, you can use the audio guide that is available. There is also an Audio Guide Family Tour geared more for kids. Our kids did it and found it to be fun (but time consuming). The kids might have had just as much fun if we just printed the map ourselves and had them to a seek & find without the audio portion. I think a better option for those travelling with a limited time frame is to download Rick Steve’s Audio Tour (FOR FREE). It is a bit more self-paced and allows you to choose what you want to see. Built at the end of the 15th century, this chapel is most known for its ceiling painted by Michelangelo. Be sure to also notice the murals painted by Botticelli along the walls. When you get to the Chapel, it will be crowded, prepare yourself in advance to not have much space to move around. There is NO PHOTOGRAPHY in the Sistine Chapel. PERIOD. This is one of the largest churches in the world and the most impressive example of Renaissance architecture. What sets it apart from others is that St. Peter’s tomb sits directly below the high altar of the Basilica. While you may be able to visit the tomb of St. Peter, the Basilica reserves the right to limit access. You can take the lift plus walk 320 steps: 10 euros. Climb all 551 steps: 8 euros. Outside the Basilica is St. Peter’s Square. 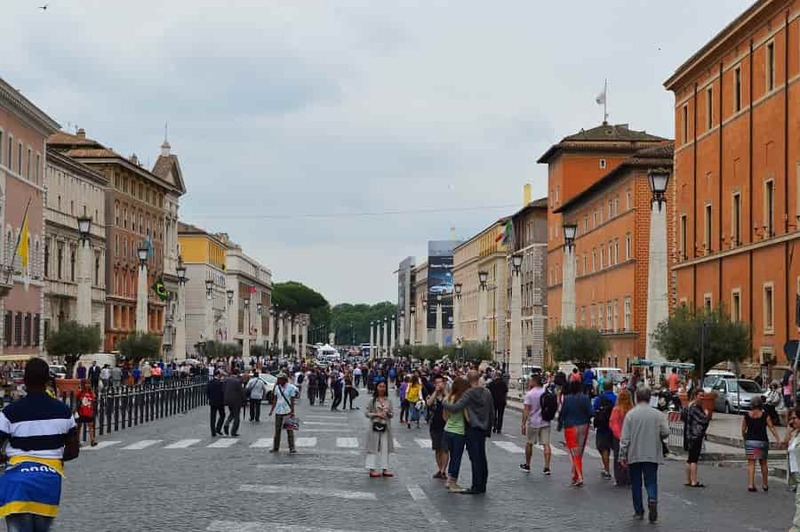 This large public square is where the Papal Mass is held twice a week. 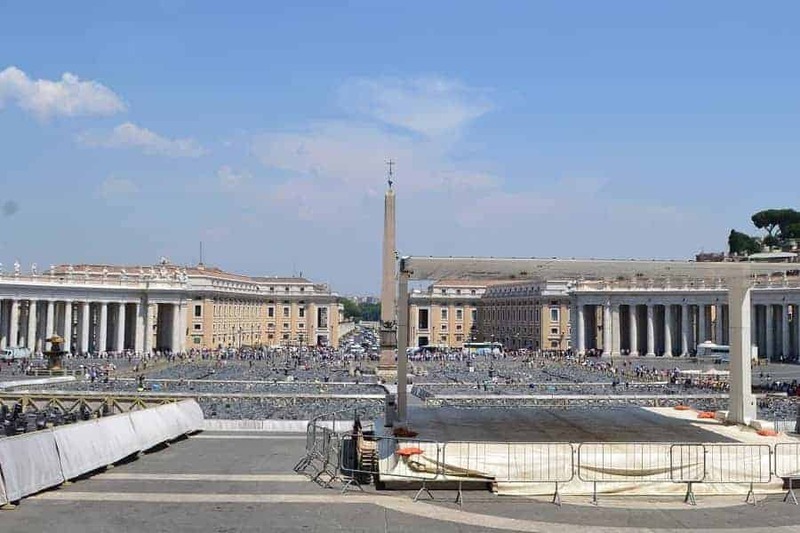 One of the magnificent features of St. Peter’s Square is the obelisk. This obelisk that was brought to Rome from Egypt by Caligula in 37 AD. 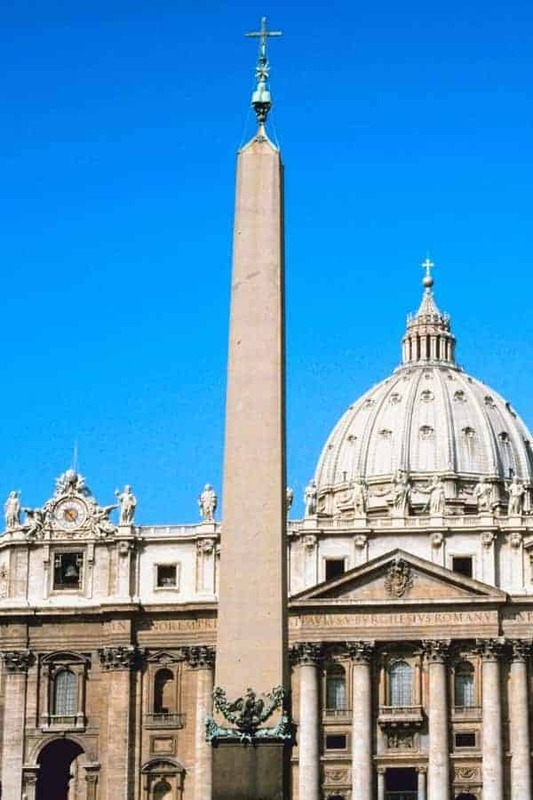 In 1586, Pope Sixtus V gave order to move the Egyptian Obelisk to the right side of the St. Peter’s Square where it stands now. The Pope’s calendar (even if you don’t want to attend the Papal mass). If you want to attend the Papal Mass, it is free. The key to getting a good view of the Pope is to get there EARLY. When I say early, I mean like 2-3 hours early. If you don’t want to attend the mass, then I suggest you choose to go on a Monday, Tuesday or Thursday (a day when there is not a Papal Mass). If you do end up going on a day when the Pope is holding mass, allow yourself extra travel time & be prepared for traffic because it is CRAZY. You need to be covered inside the Basilica and Sistine Chapel. Men can get away with knee length shorts (pants are best) BUT women and girls must cover shoulders and knees. If you get in a bind, there are several shops outside the Vatican where you can purchase a scarf for fairly cheap. Wrap it around your shoulders or turn it into a skirt that covers your knees. Purchase your Vatican Museum ticket in advance so you don’t waste time standing in the ticket line. Your ticket also includes access to The Sistine Chapel. Entry to Vatican Museum is FREE on the last Sunday of the month. It is also crowded. St. Peter’s Basilica is always free. Have you made the trip from Rome to Vatican? What was your favorite part of your time in the Vatican? Nice! Wish I’d read this before my visit to Vatican City. We still made the most of it, but went totally unprepared. Seeing this first would’ve made our lives so much easier! I’ll be sending people to this post the next time someone asks about going! We did the Walks of Italy early tour of the Sistine Chapel and the Vatican. It was so amazing to be in the Sistine Chapel with hardly any people in it. One guy even lay down of the floor and just looked at the ceiling. We completely enjoyed our day there but it will take many more days to fully see the museums and St. Peters. It’s all such a beautiful place to enjoy. Next time we’re planning on trying for a mass. I found Vatican City so overwhelming. I think it’s the combination of there being so much to see and there are so many people crammed in around you doing the same thing that it can be a tough day sometimes. I loved it, and I think one day is the right amount of time… anymore than that and I wouldn’t have survived the crowds. The Vatican is such a pretty and unique place. Since I studied art I knew alot about the pieces I saw when I visited. The only thing is this place is sooooo crowded but keep in mind I went during a busy time of the year. I don’t regret the experience but it was definitely hot and I would love to take more time visiting during cooler weather. I have to admit- the world’s smallest country is indeed very beautiful. i went to Vatican last December and completely enjoyed the experience. You have summarized the whole thing very well. We really enjoyed our times at Vatican city we went super early to avoid the queues and was also slightly off peak so we’re lucky. It’s a great way to spend a day. Great detailed review! I’ve been here so many times cause my family lives in Rome and I can say you delivered some great tips! Also check out their private morning breakfast with hour early entry. It’s anazjng! Thank you for this post, it’s exactly what I was looking for actually. I’m heading to Italy in April and wanted to visit The Vatican during my trip. This is such a helpful guide and has lots of idea of things to do.